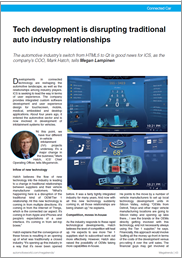 Read how tech development is disrupting traditional auto industry relationships and the role ICS is playing in this Automotive Megatrends article with Mark Hatch, COO, ICS. On March 17, in Dearborn, MI, Automotive Megatrends USA held a unique event that brought together the key players of the car industry of today with the innovators and game-changers of the lightweight, efficient, connected automotive world of tomorrow. Thanks to everyone who came by to see ICS and our contributions to some of the leading products designed for the automotive IVI sector.